With the main heroine being the adventure taking Boxcar Baby herself, J.L. 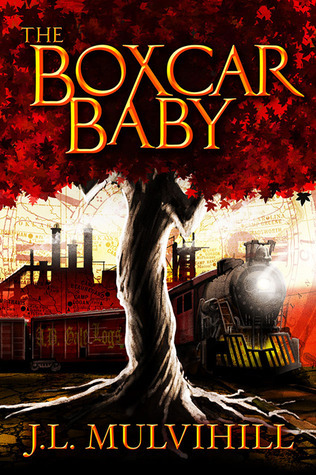 Mulvihill’s The Boxcar Baby follows AB’Gale as she desperately seeks to find her papa and set things back in order. When her papa doesn’t return home, AB’Gale takes it upon herself to discover his whereabouts before she and her family lose their home and way of life. But after discovering some bits of information and unveiling too many dangerous secrets, AB’Gale finds herself on an epic and treacherous quest to save her family and herself before she’s captured again. An exhilarating and wild read, Mulvihill’s opener to the Steel Roots series will have readers grasping for more! Look at that…I have OFFICIALLY participated in my first book tour; how exciting is that?! Firstly, thank you Tomorrow Comes Media for allowing me the privilege of participating in this book tour. Secondly, thank you J.L. Mulvihill for writing an incredible series and giving so many of us the opportunity to partake in this book tour through the creation of your works. It’s been a long time since I’ve read a steampunk novel, so it took some getting used to first. However, Mulvihill did a great job with that by providing glorious descriptions of the world and those who inhabit it. Though a little overly descriptive at times and with some minor grammatical errors, Mulvihill’s steampunk adventure is a tremendous read that grabs your attention from start to end. CONTENT & TRIGGER WARNING: This book covers sexual harassment, mental and physical abuse, homelessness, and kidnapping. Steampunk novels have certain elements to them, such as the futuristic yet historical looking technology and everyday clothing. Some authors are unable to capture this properly in a steampunk novel, categorizing more as futuristic than steampunk. However, Mulvihill depicts a steampunk setting; from the biggest details such as carriage vehicles to the minor details such as shoes, Mulvihill addresses all areas to provide an authentic yet unique steampunk universe. Mulvihill has an uncanny ability to capture each moment as though it’s a photograph, presenting the story like a photo-album to her readers. She does this for the characters (i.e. hair, aesthetic, persona), the setting (i.e. landscape, buildings,) and much more. Even the little details such as the colour and size of food’s addressed in this novel. If you’re a reader who requires a great amount of descriptors, Mulvihill’s novel is exactly what you’re looking for. AB’Gale is our main heroine…and boy, she is ONE tough cookie. Only 16-years-old, AB’Gale doesn’t allow for others to control her or sway her intentions and goals. Intelligent and courage, AB’Gale is a female protagonist that many readers can look up to in awe, wishing we were at least 10% as epic as she is. Mulvihill doesn’t create her to be this perfect heroine though, allowing AB’Gale room to grow throughout not only the novel but the Steel Roots series. Though the beginning of the novel starts with an intensity like no other as AB’Gale searches for her papa, the remaining first few chapters felt rather slow. The pacing was rather mild and boring, making it a struggle to continue on. However, AB’Gale’s adventures do grow rather quickly and create a more lively atmosphere. Like I’ve said before, I’m CLEARLY no expert at grammar…heck, I notice more and more spelling errors and grammatical issues as I look back at old posts. However, a novel that has been worked through by an editors and published should have most of this cleared out already. There aren’t enough errors that it irritated me, but it’s a good thing to mention for those who ARE bothered by this. Another thing I had a hard time with was the dialogue. The characters, such as AB’Gale, had certain phrases they would repeat…A LOT. The phrase “I don’t know” comes out of AB’Gale’s mouth (or her mind) SO many times, she could be the poster child for this saying. This is when a thesaurus would be greatly appreciated. Additionally, the way characters talked sometimes changed up. For instance, AB’Gale mainly spoke and thought in what appears to be a dialect common among the working folk. However, her thoughts would sometimes switch to proper sentence structure and remove the slang. Minor? Yes. However, I pay GREAT attention to little things like this. Mulvihill’s The Boxcar Baby is a fantastic start to the Steel Roots series; it’s fast-paced and an easy read, making it the perfect book to wrap yourself in. Even though parts were slow and some scenes seemed unnecessary, trust me when I say that these “random” parts DO work into the plot later on…pay attention! Furthermore, Mulvihill’s beautiful representation of steampunk and ability to create memorable characters trumps these faults to a “T”. Looking for a steampunk series with a badass female lead? Look no further! J.L. also has several short fiction pieces in publication, among them “Chilled Meat”, a steampunk thriller found in the Dreams of Steam II-Of Bolts and Brass, anthology (Kerlak Publishing) and “The Leprechaun’s Story”, a steampunk urban Fantasy found in the anthology, Clockwork, Spells, & Magical Bells (Kerlak Publishing). Click here to see all the bloggers involved in this Book Tour! Thank you very much! It’s definitely a different take on the steampunk genre. Sounds like quite an interesting read. It is. The last few chapters were…interesting? I don’t know if I’ll continue reading the series, since it’s more of a fantasy/steampunk read and I don’t know if I’m that committed to it, but I would definitely give the first one a go and see how you feel afterwards. It’s also a pretty fast read.